Many years ago, Croatia developed rafting as type of water transportation. Today it is also modern rafting on wild waters. Beauty of rafting in wild waters are clear and clean water, scar canyons, surroundings of woods and mountains. To go rafting you should have or rent rafts, safe waistcoats, helmet and paddles. You should avoid tight passes on rivers and fragile travertine waterfalls. 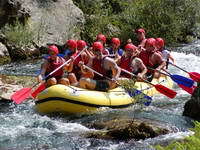 Most common rafting price is 220 HRK (30 EUR) per person. - Starting Points: Studenci, Tisne stine. - Beautiful landscape, lots of canyons. - You can enjoy in rich vegetation, cliffs, waterfalls, animal life and canyons surrounding it. - Starting point: In Plitvice Lakes. - Best time to go rafting is after much rain. - River Korana flows from Plitvice Lakes and it is perfect for rafting after heavy rains. Very attractive is rafting downstream through the canyon. - Starting points: Gojak, Trosmarija. - Ideal for rafting because of its known fast currents. - River Dobra is one of the best places to go rafting in Croatia. It has surface and underground courses, and dams and accumulation lakes make it ideal for rafting. - Starting points: Spring, Hrvatsko. - From National Park Risnjak. Rafting is possible only after much rain and in spring time. - River Kupa flows from National Park Risnjak. It is rich with water for rafting after heavy rain or in spring time. River Kupa has mountains covered with woods on one side and rich valleys on the other. - Starting points: Veliki Buk, Musko. - Ideal for rafting in spring. 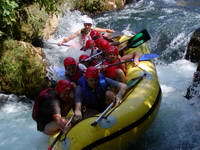 - River Zrmanja is ideal for rafting in spring, but you can use smaller crafts in summer time. Canyon of river Zrmanja is the most beautiful in Croatia. - Starting points: Strbacki buk, Losk. 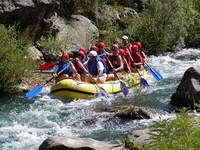 - Rafting is ideal going south from Strbacki Buk. 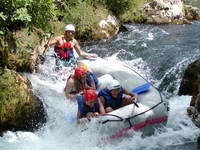 - River Una offers great experience rafting downstream of waterfall Srbacki buk, which is 20 m high. River Una makes the border between Croatia and Bosnia and Herzegovina. - Through rafting you can meet untouched part of National Park Krka. - River Krka has waterfall Bilusica buk which is the only pass you have to make in your tour. - Starting points: Kikin most, Trzic. - It has many waterfalls. - River Mreznica has many waterfalls, but other parts of the river are calm. Please write everything you are interested.